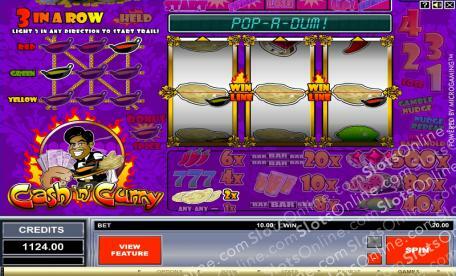 The Cash n Curry slots are exciting classic slots with a whole host of bonus features. Click here to play! While only using 3-reels and 1 payline, the Cash n Curry slots offer much more complexity with the addition of nudge features and a bonus game. While nudge features are reasonably common in classic slots at live venues, most online classic slots just stick to the basics and leave the complex stuff to video slots. The Cash n Curry slots are different. While playing a single payline, you will occasionally be given options to nudge reels down one place, options to hold reels and spin the remaining ones, or you could even trigger the trail bonus game. With so many features, the Cash n Curry slots will keep you entertained while only playing a single payline. This makes it easy to keep track of winnings and losses, and it makes for a more involved slots experience. For players who like the bonus games on video slots but do not like how long it takes to trigger one, the Cash n Curry slots should provide a welcome change. The trail bonus game is triggered when three cooking pots in a row land on the reels. These cooking pots are attached to other symbols, and are color coded. Once triggered, the game switches to a bonus boardgame trail, with different spaces offering various rewards or nasty surprises.